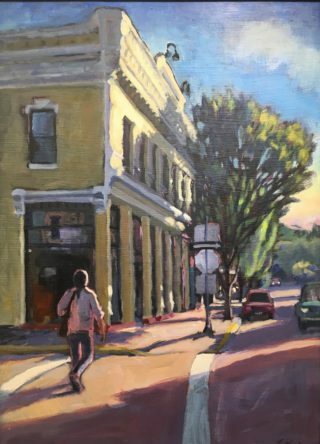 The Springfield Arts Commission is pleased to present Towns & Trees: Impressions & Abstractions, an exhibition of paintings by artist Margaret Plumb. The show will run from February 1-28, 2019 with an opening reception from 5-7 p.m., Friday, February 8. The reception, which is open to the community, will feature the artist, light refreshments and live music by The Jazz Flute Project. Plumb, a local Eugene artist, is known for her vivid, saturated palette and bold, free, lively brushwork. She is both a plein air artist and a studio artist, whose mostly impressionistic representational, and some nonobjective works capture her environment. She has studied and worked in oils, watercolors, pastels, and pen and ink—but has been painting almost exclusively in acrylics for the last few years. The Springfield Arts Commission encourages the community to attend the gallery reception on Friday, February 8 to meet the artist and enjoy live music by Frank Poloney and The Jazz Flute Project. The Jazz Flute Project has been performing swinging jazz standards, bossa nova, and soulful ballads in and around Eugene since 2015. This performance will feature Frank Poloney on flute, John Polese on piano, and Rick Carter on bass. Together they present classic melodies and fresh variations on jazz themes, in a serene yet engaging style.